Firearms History, Technology & Development: What's Wrong With This Picture? A couple of months ago, we discussed a hilarious video about how not to shoot a firearm. 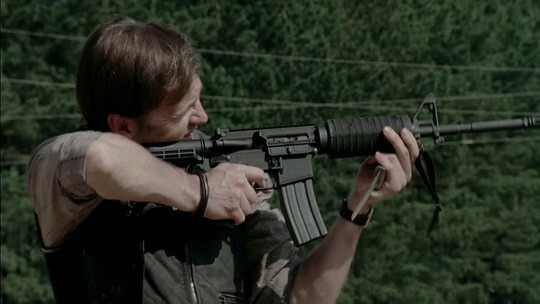 Now here's a screen capture from the popular TV series The Walking Dead. Scene from The Walking Dead. What's wrong with the above picture? Read on to find out. So what's wrong with the above picture? First, notice the character's off hand. He's holding a pretty sharp knife in it, while attempting to support his rifle at the same time. Not a very good idea. Next, notice how he's intently peering through the sights. Wait, did I say sights? I should have said "sight". If you look closely at the picture, notice that the rifle is missing the rear sight! This person must be one heck of an expert shot to not need a rear sight! It's just like a bead sight with a lot of offset! Actually, it looks a lot like he's peering through an invisible scope.